It was my last day before a trip and I needed to pack rather than cook, so I found myself in Lucky Lupitas. In the last few years Adelaide has gone Mexican mad with pop-ups, food trucks and all the usual paraphernalia of hipsterdom. However Lucky’s was the trailblazer. So much so, that there would be a line up in this most improbable location, tucked (just) off a freeway as it cuts through grey industrial suburbs. South Road is arguably the ugliest road in South Australia, so why would anyone chose to spend a night out here? But they do. And they did today. It was not even 6 pm and the restaurant was already busy. I chose the not very Mexican hamberguesa, but with Mole Verde: a blended sauce of pickled jalapeño, pepita, cilantro, green onion & garlic. And papas fritas of course. 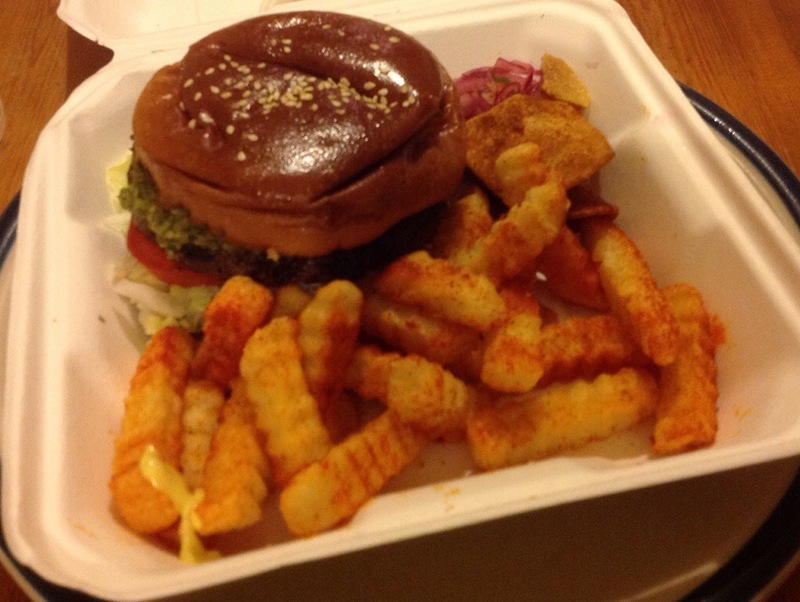 I have travelled throughout Mexico and I cannot recall seeing burgers on a menu, but Lucky’s also offer authentic looking street food and, moreover, their burgers are rated the best in Adelaide. My meal was certainly interesting: good flavours from the mole, although I suspect it was somewhat Aussified- I would have had much more chilli. A nice touch was the corn chips and jalapeño mayo dip on the side…. and the fries were to die for. I guess that’s why you would brave South Road after dark. Dude! Crinkle cut chips? Seriously? I know! But the coating …..